Traditionally teleprompters were seen solely as a studio staple, but for more than two decades they have been consistently supporting talent in the field in a variety of locations around the globe. The numerous step changes in technology, which have had such a dramatic impact on all types of television equipment, have also revolutionised the world of teleprompting both inside and outside of the studio. If we look back twenty years, the set up in the fi eld is hard to comprehend compared to the slick location prompting equipment of today. Even the simplest fi eld presenting would have needed a team of people, a huge CRT monitor, a clunky PC and a bag full of batteries to keep the equipment powered up. Fast forward to today and everything is lighter, smaller, smarter and infi nitely more user friendly. Historically, the single most important transformation in this generation of teleprompters came with the development of the microchip. In the days when prompting became paperless, there was no more retyping scripts, as these could easily be imported, and instant clean script changes made where necessary. The appropriate software, such as Windows, allowed a huge selection of international fonts to take prompting into many more regions. Now, we are into the realms of wireless and tablets and prompting has entered an entirely new era. Away from the studio, the latest prompting solutions on the market have not only transformed fi eld news reporting they have also created a thriving market for alternative location applications. Teleprompting is growing at a signifi cant rate outside of broadcasting, and today, common applications include everything from corporate announcements to educational and government training videos. For these types of productions, budgets and time are limited, and the prompting solution is used to bring a quick, professional and polished performance from the amateur presenter. The prompter can be invaluable, particularly for company announcements, where there is precise statistical or factual information that has to be presented by a busy company director. The script on the prompter can ensure the accurate message is portrayed, while removing the need for a multitude of time consuming takes. These applications require a simple entry level system with a pre-set script that runs off a laptop, such as Autoscript’s Xbox Lite, which includes the company’s WinPlus smooth scroll circuitry incorporated into its broadcast standard products. The entry level Xbox Lite still incorporates full-featured prompter software, and the scrolling can be performed via the deskpad scroll control. This type of minimalist equipment allows the necessary rapid set up for simple pieces to camera and pre-recorded presentations. The prompter can be used to ensure that the talent gets the piece to camera right, fi rst time, making it far quicker and more cost effective. The more common location prompting scenarios with which we are all familiar in this industry is fi eld news reporting. 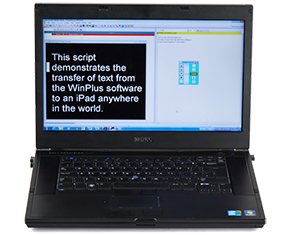 The basic requirements for prompters in these applications are simple. Firstly, they need to be light and bright. As obvious as it sounds, shooting outside demands a high bright monitor which is easily visible in sunlight so it has to have a high contrast ratio, and additionally it needs to be as light as possible and portable enough to be transported with all of the additional fi eld equipment. Location prompting for news also demands a more sophisticated system, such as Autoscript’s Xbox Ultra. This system incorporates the company’s renowned WinPlus, which is used by newsrooms around the world as it delivers the fl exibility and smart design that professional broadcast environments demand and is also adaptable enough to be used in any studio, newsroom or location environment. The Xbox Ultra package includes either the WinPlus Newsroom or Studio software, along with the Xbox Ultra USB, and is a portable prompting solution that integrates laptop and PC compatibility via a USB 2.0 interface. WinPlus Studio, a windows-based software package, provides an intuitive on-screen editing display and a pointn- click interface. The video output available from the system provides wide compatibility as it is standard composite PAL/NTSC and also has an SDI option. In the fi eld, the operator can have the fastest response times via the integrated USB 2.0 support that eliminates lag in next and previous story selection, and allows faster editing and on-screen changes. One of the most fundamental requirements of prompting in the fi eld is ensuring the presenter has a fully updated script. We have all witnessed the rapid rate of change in the world of breaking news stories, and the talent needs to have the ability to report the correct news out in the fi eld while it is continuously updated. This has undoubtedly been improved by speed of networks and wireless networks which has made it easier to receive full live news updates. The modern prompter systems, such as the Xbox system, are attached to the reporter’s main network so as the scripts are written in one part of the world they are updated automatically for the fi eld reporter, ensuring the presenter has a fully updated script. The latest location prompting trends has been infl uenced by escalating popularity of tablet computers and has brought affordable prompting systems to a far wider audience. Tablets have had a marginal effect on professional prompting applications due to a number of limitations, however they have given personal users their own pocket prompters. Tablet computers can be extremely useful for location prompting where an operator may not be able to obtain or transport a full prompting kit. The operating systems are upgrading regularly and as new features are being added, tablets are set to become even more versatile in the future. There are also many prompting applications for iDevices but, again, few are suitable for professional use. Autoscript recently announced the launch of its WinPlus Remote, an iOS-based teleprompting system that is capable of delivering up-to-date scripts to users in the fi eld, anywhere in the world. When WinPlus Remote is installed on a networked PC in the production facility, the latest version of the script can be seen by journalists on location, as well as in the studio. The software enables the script to be automatically uploaded to an FTP site where it can be downloaded onto an iPad by talent in the fi eld and kept constantly updated. WinPlus Remote works in conjunction with the iOS app, picoPrompt, and has already been tested in many challenging locations where it would otherwise be impossible to have all the functionality of a full prompting system. For example, one of the UK’s biggest news broadcasters recently used the system to support reporting on major news stories such as the UK fl oods and the crisis in Ukraine. There have been iPad prompting apps on the market for some time, however, they did not have a link to the newsroom, which effectively meant there was no access to live updated scripts on location. Instead of having the director conveying the script changes via an ear piece and a journalist having to manually make the changes, this system allows them to refresh the script with the click of a button. This year marks thirty years in the business for Autoscript, in that time the company has shipped more than 9000 software systems, and has been at the front end of many of the technological changes in the industry. The latest advancements will ensure the future of location prompting technology is brighter and lighter, and that talent in the fi eld has the same real time technology and functionality as their colleagues in the studio regardless of their location in the world.